The plaintiff is a real estate investor. It bought and fixed up a property in New Jersey. Afterwards, the plaintiff listed the property for $7,788,000. 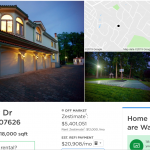 On the property’s Zillow page, right below the listing price, Zillow displayed its zestimate of $3,703,597….